Brown rice has not been part of the Art of the Home recipe journal (cahier de recettes) for a long time. In fact, we did not care for it very much until we discovered this way of cooking it. We did try to cook it from time to time, as we would white rice, but it would always come out either too crunchy or too mushy. We had to throw out a few batches which is always a shame but in retrospect it was worth it because it led us to this recipe which is so simple and finally cooks brown rice just right. The secret: baking it and letting the steam do its magic. This side dish is perfect to serve with either fish or poultry and can be part of many restricted diets (low cholesterol diet, gluten free diet, or high fiber diet) so it is an healthy side dish to keep in mind. We serve it at least once a week, if anything, it’s very good for your digestive health, low fat, and prep. time is less than 5 minutes, how great is that? So enjoy and bon appétit! Put brown rice in a shallow baking dish. Place thyme and bay leaves on top of the rice. 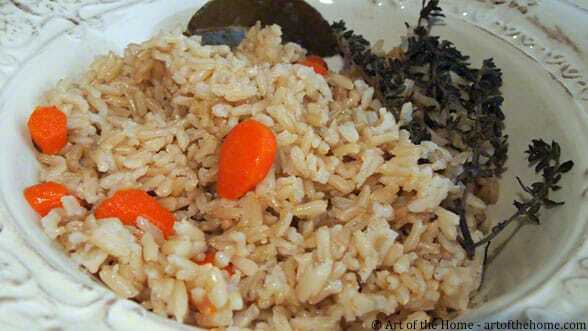 Peel and wash one carrot and cut in small rounds directly on top of the rice. 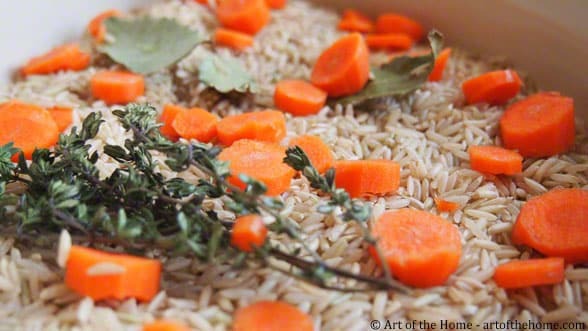 Bring water to a rapid boil (we typically use our tea kettle – quick rapid boil) and pour on top of rice and fresh herbs. Add a good soup spoon of olive oil, 1 coffee spoon of salt, and pepper (optional). Cover baking dish with aluminum foil as tight as you can so the steam is trapped. Bake for 45 min. Turn the oven off and leave inside the oven for at least 30 minutes (we often plan for 1 hour). Your rice will be soft and moist but not mushy. Broth substitution: depending on your side dish, you could substitute a broth (chicken if you serve a poultry or beef broth if you serve beef). This can add a delicious flavor to the rice. In this case however, we do not add salt or just a couple pinches at most. Great side dish to go with a fish en papillote: easy, healthy, and delicious. Add a dash of sophistication to your weekly dinner and serve your rice in a timbale. Great for portion control as well! Invite your friends or loved ones that are on a gluten free diet and enjoy a great meal together!